They are intended to help people better understand the power of kaizen and to motivate them to direct their efforts to kaizen – even if it means diminishing or dropping other improvement activities. Kaizen is a simple, one-word business strategy whose strength and comprehensive nature is deceptive. Kaizen is kryptonite to your competition. If you were allowed to copy only one thing that Toyota did, it should be kaizen. Why? because it is Toyota’s industrial engineering-based kaizen that led Toyota its production system and The Toyota Way. If you copy Toyota-style kaizen, it will lead you to success. It might lead you to Toyota’s production system and The Toyota Way, or it could lead you somewhere else, to something better than that. Perhaps something much better than that. You won’t know unless you try. While kaizen can be practiced in many different ways, it is Toyota-style industrial engineering-based kaizen that produces business results. There are numerous methods for achieving business results, as the image shows. But, most of these methods are zero-sum (win-lose), and inevitably turn key stakeholders against the business and its interests. That makes management’s job far more difficult. 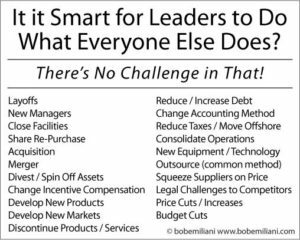 If an organization faithfully practices Toyota-style industrial engineering-based kaizen, then its leader would not need to apply zero-sum methods to achieve business results. Think about that. Kaizen also offers the opportunity for corporate redemption. As everyone knows, big corporations and corporate leaders are held in low regard by the public these days. Kaizen can restore faith, credibility, and trust in corporations, and also return its leaders to the now-forgotten role of industrial statesmen.